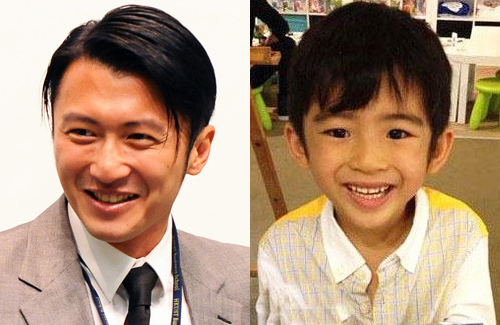 When Nicholas Tse (謝霆鋒) and Cecilia Cheung (張柏芝) divorced in June 2011, they agreed to have joint custody of their two sons, 6-year-old Lucas (謝振軒) and 3-year-old Quintus (謝振南). While baby Quintus had not known what happened then, Lucas was fully aware of the situation. On the surface, the young boy had to accept his parents’ decision but it has been observed Lucas has been acting out as a means to cope with his parents’ divorce. The recent child abuse case at Hong Kong’s prestigious Rosaryhill Catholic School has taken the city by storm. It has once again sparked the public’s curiosity about what really goes behind the doors of the preschools. For that reason, the reporters at East Week paid a visit to Lucas’ school. Reporters noticed that Lucas is active and mischievous in class. While other students were busy studying in front of the computers, Lucas was impatient and constantly playing with his fingers. Eventually, he teased the classmate next to him out of boredom. When his classmate ignored him, Lucas got out from his seat and walked around the classroom. At one time, he almost got into a fight with another classmate. Fortunately, the teachers were watchful and a strong female teacher assistant was able to hold down Lucas’ shoulders, thus preventing a fight. Lucas and Quintus are growing up under the public eye, similar to Nicholas’ childhood since he was born to famous parents Patrick Tse (謝賢) and Deborah Li (狄波拉). A normal family outing in September last year became a big affair in the eyes of the media, when a bikini-clad Cecilia was seen holding hands with her ex-husband. How can a little boy of yet 6 handle his parents’ divorce and the media’s attention at the same time? It is also no secret that Lucas is constantly hoping for his parents’ reconciliation. Nicholas’ younger sister, Jennifer Tse (謝婷婷), once revealed that whenever Cecilia goes overseas for work, she would bring her children along, causing Lucas to miss school. After media snapped photographs of Cecilia holidaying with her two sons, she began to restrain herself from disrupting Lucas’ studies. However, two weeks ago, she was once again photographed with her two sons holidaying in Taiwan after attending a good friend’s wedding. With Cecilia’s indifferent attitude towards school and studies, Lucas may pick up that vibe and consider school to be of little importance. He is only six, I think it’s normal if her mom prefer to bring him with her. Normal kids always act like that. Don’t even know why report this kind of news. It’s not even a news, it is just every day life kinda things. You are so right – Lucas will grow up thinking he’s all that (just like Patrick Tse). He will say I’ve been riding the airplane all my life since the day I was born. He will think riding the bus is ghetto. Cecilia may think education is not important b/c she has no education and she’s still doing so well in the movie industry. >While other students were busy studying in front of the computers, Lucas was impatient and constantly playing with his fingers. Eventually, he teased the classmate next to him out of boredom. When his classmate ignored him, Lucas got out from his seat and walked around the classroom. No, man. You know what this is? A spoilt brat being a spoilt brat. I see well-behaved kids at Yuen Long (one of HK’s poorer areas) where the kids eat lunch alone, whether it’s at McDonald’s or their own packed lunch, then they haul themselves to their afterschool tutoring centre and do their homework there until their parent comes in to pick them up, or they go home themselves. This brat I tutored today: he gives his maid hell while his mum and dad work. Doodled all over his sister’s diary, stole her stickers, doodled over the pictures that she drew and hung on her wall, drew on the cover of the library books, screams for no reason, drew on my Nike shirt, put glue all over the floor. Seriously, spoilt kids, man. Friggin powerbomb them out of a window. Have you tried “water-boarding” them? This Lucas Tse sounds like trouble. I guess it runs in the family. My paternal grandfather had gone to school with Patrick Tse and he told me all the exploits of Grandpa Pat. I don’t know. I’ll think of ways to discipline them without leaving any evidence. Slapping them in the face with a hand made of ice. No fingerprints. Or the old hammer and phonebook combo. No bruises, no witnesses. I don’t see Patrick and Deborah as a good person – based on my own vibe. Obviously the kid is spoilt by everyone involved in his upbringing. What he needs is stability and a little discipline. Keep the kid out and let the dogs out! A reporter can just stand outside a classroom for so long and witness all that without any trouble? Is this a zoo? It’s hardly surprising that Cecilia doesn’t give a fig about her children’s education. I bet this kid will end up in showbiz too. what if the kid does not do well in showbiz? Spoil kid, next drop out of school. The reporter of this article went to the school with intention to target on Lucas because of his famous parents. The article is mainly about Lucas and no other kids. I believe there should be more than just one problem kid in that school. First of all, he is 6 years old. Tell me, which 6 year old doesn’t act like he does? It is perfectly normal. He is not some spoilt brat, just need a bit of discipline. If a kid just sits there quietly, something is wrong. He is acting normally even if he deserves some spanking. >Tell me, which 6 year old doesn’t act like he does? The rest of the kids in his class? I’ve been around kids a lot these past few months. Like adults, kids all have different personalities. Some kids know what they need to do and do it, while some are spoilt rotten. And you can usually tell which ones are spoilt. But we don’t know do we because the reporter chose to highlight on him and fair enough, he is famous because his parents are famous. Come on, he is 6. It is normal. Kids need routine, specially boys. you can’t say “oh, he’s only 6” next thing you know he’s 10 then it’s too late. Or maybe he has ADD, if that’s the case they will definitely need pay more attention to him. I can see from the messages on this board that most of you don’t have any kids. If you did, you would see that Lucas’s behavior is actually quite normal for a six-year-old. Boys that age, and I emphasize “boys,”Tend to have a short attention span, are curious, and can’t sit still for long periods of time. Hence, Lucas’s behavior does not indicate that he is spoiled or a bad kid at all. Please go online when you have two minutes of free time and look up some child psychology articles. It will greatly help you open up your eyes for when you have your own kids in the future. In addition, I think it’s wonderful that Cecelia chooses to bring her kids along when she is out on tour. Kids at that age need to bond with their parents, especially their mothers, And I’m glad that Cecelia has the maternal instinct to guide her. Again, if any of you doubt what I have just expressed, please do some research on child psychology, and then get back on this board and make your comments when you are more fully informed. And another advice is if you choose to acquire all your knowledge on the internet, you will always be limited. You are absolutely correct that the child falls under the norm of ‘short attention span’ as it is part of the growing up process. However it is also the parents responsibility or the dominant care-giver to show the child what to do, what not to do, what’s okay to do and what is not okay to do. Many of the commentors here are making assumptions that this kid’s parents aren’t doing their jobs, thus the prediction the child is spoiled. Honestly, I believe most of these comments are geared towards Cecilia and Nicholas and not the child. But yeah, maybe some social psychology will help you better interpret things or maybe don’t misinterpret things? Ugh, last word of advice, don’t rely on the internet to learn about social psychology. Oh, if she was to follow her maternal instinct, she would drop her tour, and be more with the kids. Sure she has to work to earn money, but not having a tour here or there won’t hurt? Or change the tour time to coincide with summer holidays? Just to let you know that I have 2 boys so I can speak from experience. Yes, a 6-year old boy is going to do what a 6-year old boy does, but it is the parents, responsibility to discipline the child for bad behavior. My boys are rowdy and playful, but they would not get into fights and disobey in class. If the other boys in his class can behave well, he should be able too. So being a 6-year old is not an excuse for bad behavior. While it is wonderful that Cecilia is trying to bond with her kids, taking them on trips with her, it is not okay when the kids are in school. I am a total supporter of keeping the kids in school during the school. I will never allow my boys to skip school unless they are sick. What gets me is that people say that it’s okay because they are so young that it doesn’t matter if they skip school a little bit. But it does, the elementary school years actually sets the foundation for their education going into junior high and then high school. A good educational foundation is essential to their future educational success. It’s like a building..if the building does not have a good foundation, it’s going to crumble and fall. If the child does not develop good study and schooling habits when they are young, they are more likely to fail in school later. Also, taking your kids out of school for vacationing sends a bad message to the child that having fun is more important than getting an education. While I agree that some boys tend to do that at the age, I agree with Crystal that parents should be the ones responsible for telling the child what is ok and what is not. I believe children need some form of positive discipline, or rather, a firm but loving guidance on what sort of behaviors are expected of them and I also agree with JuJuBee that age is not an excuse for misbehavior. I share a similar view with JuJuBee about kids’ education. I believe that during the academic year, kids should continue to attend school unless they are sick or there is an emergency. I strongly believe that children need routine, though it may seem unimportant for very young children to have a routine, they actually need it more than we think because kids thrive on having routines. While as a mother, I can understand why she would bring her kids with her, but I personally don’t think it’s a fantastic idea to pull the kids out of school to go on tour because it would disrupt their routine and give them an impression that school isn’t very important, this may actually stick with them throughout their schooling years and later on as adults. I feel that keeping them in school may teach them a sense of self discipline, such that everyone has to be at a certain place , at a certain time , for a certain purpose and for them, this place is school. If Mum’s on tour, there’s still daddy. If daddy’s on tour too, there’s still grandma and grandpa. I’m no child psychology expert but I feel that one can read child psych articles just to get an alternative viewpoint versus one’s own, which is what I do. However, I wouldn’t rely on it too much because every child is essentially different. Their minds are just so brilliant and so limitless which is beyond what any child psych article can encapsulate. Many times I’ve tried out so called expert techniques and tips from these child psych articles and each time my own kids would astound me with thoughts or actions not even mentioned in those articles. Parenting is a sometimes difficult and tricky business but I think Nic and Cecelia are trying their best, like the rest of us, not to raise brats. I agree with Siying and JuJuBee. Before I diatribe it all up in here, let me tell you what I do: I’m currently here in HK tutoring English (in Cantonese, Mandarin and Japanese) to children, teens and adults. I also work freelance translation on the side. I work mostly with children because that’s where the demand comes from right now. So this rat-bag kid I teach lives in a 4 bedroom apartment in one of HK’s richer areas. His parents pamper him and his maid accompanies him to school and his afterschool activities. Don’t think he’s ever had to make himself a sandwich or anything. And this is exactly where the problem lies. When you’re a child, of course the scope of your world is small and your responsibilities are scaled to the wideness of your world. What are the things a 4 year old can be told to do? “Wash your hands, clean your room up, go get the door, go get me a cup of water, fetch me ***”. If you do NONE of these things, this sense of responsibility that kids so dearly need to learn is completely null. During the last lesson I had with him, he drew all over his sister’s pictures that she had hung on the wall, he opened the printer’s paper-cart and stuffed crap inside, glue everywhere, drew on my Nike shirt, tried to punch me, etc. I told him “this is your sister’s stuff and your sister’s room, she’ll be mad”. You know what this little crap told me? Holy god. Listen, this is all the parents’ fault. If there are no consequences for any of his actions, then he will be encouraged to do anything he wants, even if he knows they are morally incorrect because he has nothing to lose. And what does this lead to? A sense of entitlement. No discipline. Doing whatever they want to do. Thanks for the link, while waiting for the vid to load, I read the comments there and some were just hilarious. Kids attention span? My friend was able to train her 6 year old son to have an attention span of over 45 mins! Everything is training & discipline. The incident was 10 years ago & he grew up okay. Dr. B. Spock a child expert…. It was so sad & pathetic his son committed suicide. So…? All the books are a guide to go by… No one understands one’s own kid/s like a parent. How much one can “bend’ the rule/s or not to raise kids. I lost you at the second half. Uhm, I think he mean even though the dr was using expert techniques, and having expert opinions, but if you disregard your own understanding of your kids, finding out that your kids behaviours contradict your expert opinions, you will bend that expert opinions to let your kids bad behaviour slide, resulting in spoiling the kids? I personally think all of you just think he is a spoiled brat because of his famous parent. What do you expect of a kid that grew up in popular eye, parent so famou and parent being divorce plus Lucas is so young. Is hard enough for parent to be divorce but he is under public eye and not having normal life. Nono, it’s a bit of both. And there’s never really one reason why a child becomes spoilt – it’s always a culmination of things like their parents bending over for them over time. Cecilia has money and Nic also takes care of them which means they can pretty much buy anything and have stuff to eat whenever. They probably have a dom. worker to clean up after them so they never have any chores and have their own cook to whip something up whenever they feel like it. And then they’ll never say “no” to their kids otherwise they’ll think “oh, mum/dad said ‘no’ to me, I like mum/dad better afterall”. So their bad behaviour is rewarded/ignored and over time they’ll think it’s OK to be able to do whatever they want since there are no consequences. School? No, doesn’t matter. I’m not here to learn, I just want to play. And if someone says something I don’t care because even if the teachers get mad, my parents won’t get mad. And it branches off from there. Has anyone seen the interview where Lucas accompanied Cecilia? It was for a Stephen Chow movie I believe. From a maternal perspective, its’ understandable that she wants to keep her kids close but judging from the way he was acting and running around, she clearly doesn’t put her foot down when it comes to parenting. Being nice is a way of spoiling kids. And I don’t think that’s right. Just my two cents. Not sure but this Lucas may end up like Lindsay Lohan or like Michael DOuglas son who OD’d on drugs because he is bored with too much external stimulation and lack of parent involvement and guidance. The mother is a piss poor example of mother and the father is just slightly better. The grandparents should exert some influence or guidance on their grandchildren but wait, they are from the same mold. Hope that the little brother Quintus is much better and grow up in accordance with social and societal norms. My son is only five in Kindergarden and is reading first grade level and doing first grade math. Lucas is six and is bored at school? Come on…CC needs to get it going or else her kids are going to take this pattern as their way of life. Poor kids. I don’t think he is spoiled or anything. I think the divorce has some effect on Lucas. I frankly don’t believe in this media report..
And parenting is such a broad topic too. This isn’t a child abuse case (which this article states). It’s just a child’s tantrum. It’s quite normal for 6yr old Lucas or boys (even girls) of that age to throw the occasional tantrum, short attention span, etc. but it’s really critical between the age of 5 to 12 that the basic foundation of ‘when to be serious and when to play’ should be taught. Of course the divorce will have an impact on him and it’s up to both Nic and CC to ensure that this does not turn into a ‘rebellious’ stage for Lucas as he is growing up cause both of them have been through it themselves. I’m sure both wants the best for the boys but Nic will prove to be a better parent than CC and Nic allowed the boys to be with her because they’re young and really needs their mother around. But CC’s mothering skill is far from good. It’s quite obvious she hasn’t taught Lucas the basic principals of schooling (learn, share, respect, etc) and if this carries on, Lucas will turn into a spoilt brat and a bully with bitter thoughts about his parents’ divorce and they were the cause of his behavior. Nic should step in now before it gets out of hand. By the way, CC should be present at the birthday party for the sake of Lucas. She always have her friends and brother babysit the boys, let’s hope they don’t pick up bad habits because it’s proven now already that she doesn’t discipline the boys at all and regards school as unimportant. It’s reported some time ago that she has this ‘ghost children’ in her apartment. Could Jayne or anyone shed some light on that again ?? What’s Nic’s reaction to that ?? ?